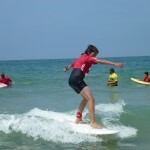 You are passionate about surfing , you dream to learn or improve your surf level : Go and Surf welcomes you in Labenne Ocean for a surf camp with unforgettable ride on the best spots in the Landes. 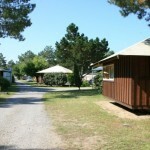 For your Surf camp in the Landes, we welcome you in the campsite of Les Pins Bleus,at Labenne Océan. 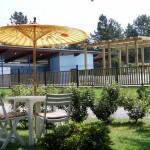 The back banana are bungalows of 27 m² with external deck for 5 people, they are located in a grenn park of the campsite. A kitchenette and a bathroom with separate WC. You will find: Blankets, pillows, kitchen equipment, gas hob , fridge, dishwasher , microwave , coffee machine , garden furniture , wardrobe …..
Bring your sleeping bag or your sheets . 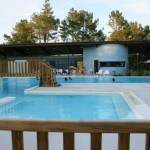 The campsite of Les Pins Bleus offers wifi at the reception , swimming pool with water heated to 26 °c , rental bicycles and canoes and have a restaurant . We have developed a specific program for this Labenne surf camp, allowing you to acquire, during this week, many knowledge about surfing and the ocean while exploring the Landes department. 5 half day surf lessons on the various mythical area beaches. 1 half-day technical training with Indo board, take off buoy , street board and technical exercice . 1 or 2 introduction to stand up paddle, the new discipline , just try with us…. Tuesday : Surfing lesson at Seignosse and stand up paddle on Hossegor Lake. The Labenne surf camp can be modified depending on the weather conditions. A minimum of 4 people is needed to validate the surf camp.